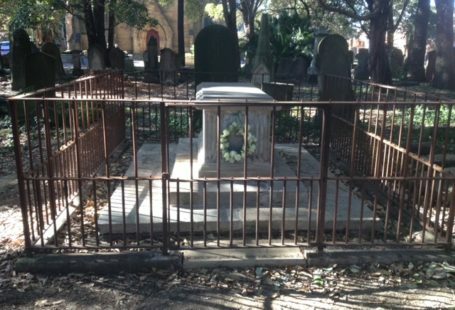 I hope this factual account about finding James Kidd’s grave inspires others to locate their ancestors amongst the historic graves of Camperdown Cemetery here in Sydney. In writing the story about James Kidd’s life, I realised that I needed to delve deeper into his past, find out who his parents were, where he came from and how he came to be transported as a convict to Australia. In this quest I have uncovered a proud Australian. My husband Geoff Rundle is descended from James Kidd, his third great grandfather, through the paternal line of his maternal grandmother Sylvia Rita Lenore Farrell. James Kidd was a Scottish convict who was given a new start and the opportunity to reform his ways and he went on to become an outstanding citizen in a new land. He was convicted for fourteen years, on 14 April 1830, at the Perthshire Assizes in Scotland for his involvement in forging two one pound notes. Kidd was transported to Sydney, Australia aboard the Burrell on 22 July 1830, arriving on 18 December, 1830. 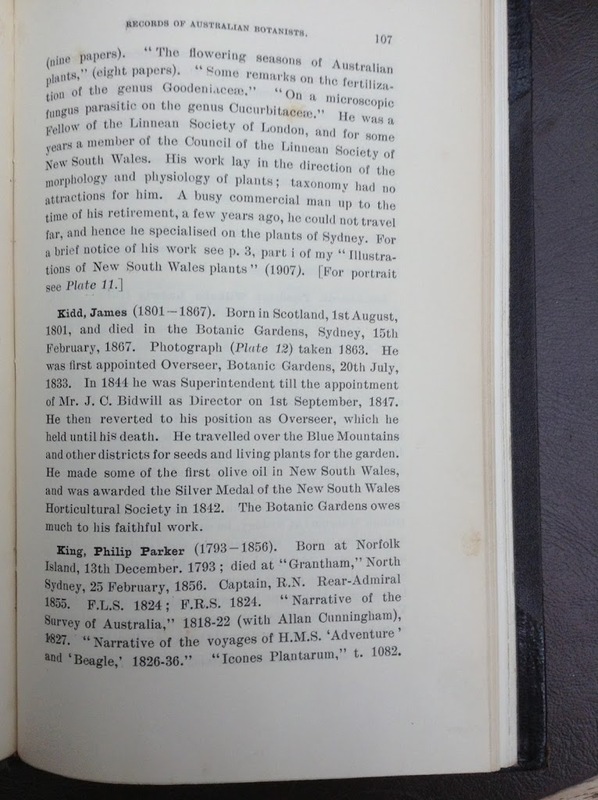 James Kidd provided information on his transportation papers that he was a gardener from Fifeshire, and upon his arrival he was immediately placed with the Botanic Gardens of Sydney. James Kidd’s first wife Mary Ross, and their three surviving children, John, James (baptised George) and Mary Ann (baptised Margaret) followed him to Australia aboard the Drummore. 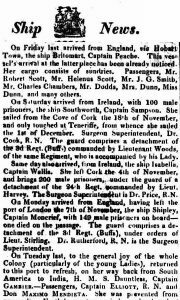 Also listed aboard the boat was Mary’s sister, Jane Ross, listed on board with several other women as milliners. 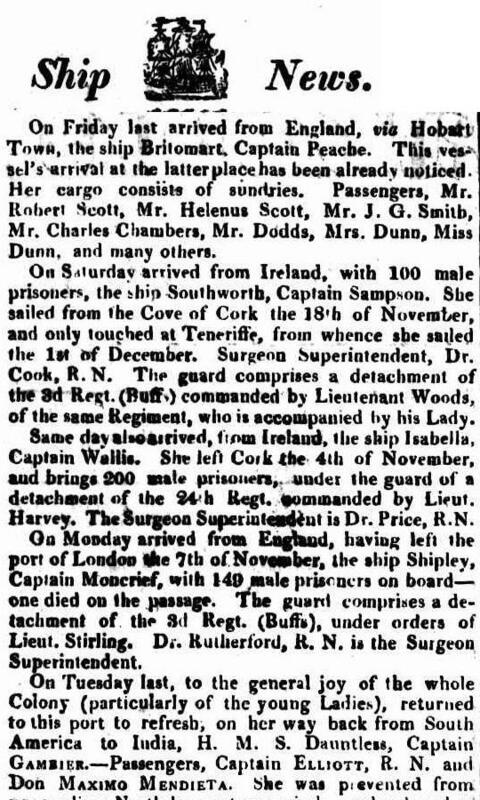 Twelve days after their arrival, Mary Kidd tragically died on 28 November 1832. 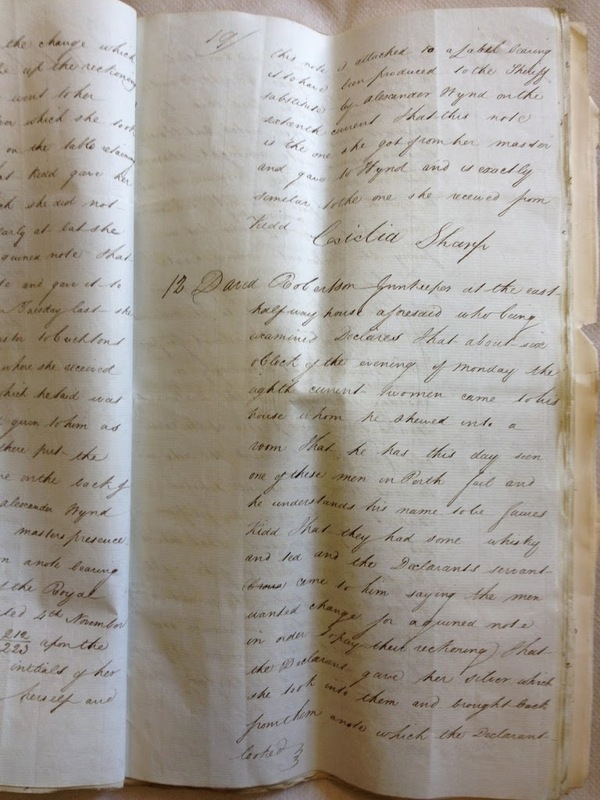 These facts are found in several handwritten pages in James Kidd’s application for acceptance for his daughter Mary Anne into the Orphan’s School in George Street, Sydney Town. James’ application explained his dire predicament, with not only a daughter to look after, but two sons to bring up without their mother. It must have been a most shocking and sad time for James. These historic papers were a vital link to James’ past, giving details about his family, along with a statement providing evidence of Mary Anne’s Baptism in Dundee, and revealing his homeland in Fifeshire, Scotland. Most importantly for me was that his wife’s maiden name of Ross was recorded. This name has been vital in my tracing James back to his family parish at St Andrews and St Leonards in Fifeshire, Scotland, where I found his sons John, Alexander (who died in Scotland) and George (called James) Baptism’s naming Mary Ross and James Kydd/Kyd as their parents, which correctly corresponds to their age listed on the Application for Admissions for his sister Mary Anne to Orphans School. I finally found Mary Anne’s baptism in Dundee, after much searching, and it was revealed that she was in fact baptised Margaret as the dates from the Orphans School parallel each other. My discovery of Mary Kidd’s migration aboard the Drummore was exciting. 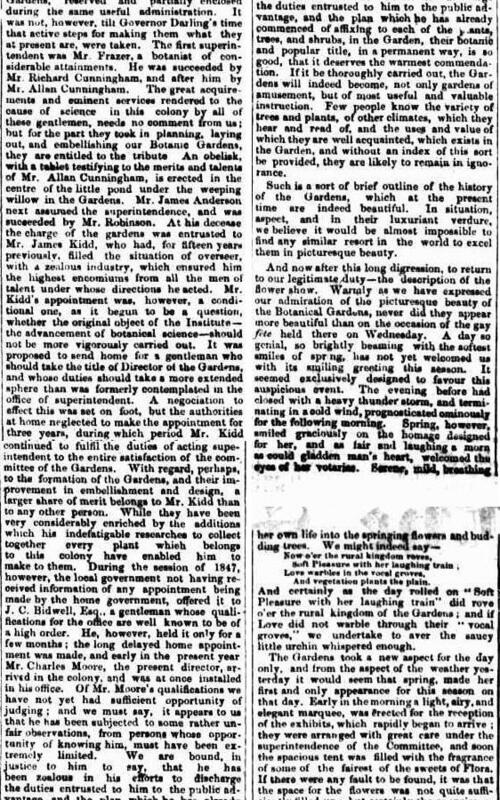 I was trawling through Trove digitised newspapers and came across this newspaper article, and my heart suddenly quickened. In 1901 Devonshire Street Cemetery was razed for the building of Sydney’s Central Railway Station and many of the headstones were relocated and bodies resumed to cemeteries all over the Sydney metropolitan area including Camperdown, Botany, South Head and Rookwood Cemeteries, to name just a few. However, many headstones were not re-claimed by their families, resulting in 2825 headstones being removed to Bunnerong Cemetery. Sadly by 1976 only 746 headstones survived when they were again relocated to the newly founded Botany Pioneer Park. It was an incredible experience to visit there in March 2019 and find amongst these lovely old stones the headstone for Mary Kidd and four of the infant children from James Kidd’s second marriage to Mary Ann Must. It was tragic to see that Hannah Kidd, died 18 January 1937, aged 7 weeks, Thomas Peter Howell Kidd, died 3 January 1842, aged 15 months, Peter Howell Kidd, died 22 December 1848, aged 3 years and Henrietta Kidd, died 24 December 1848, aged 1 year. James and Mary Kidd’s daughter Margaret “Mary Ann” Kidd was born in Scotland and baptised on 21 June 1829 in Dundee (1829-1897). Mary Ann and Edward Melvin (-1873) had one son James Joseph Melvin (1852-1927). 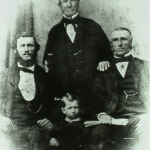 Mary Ann then married James Dillon in Pitt Street, Sydney in 1853 and they had three children John Dillon (1853-), Joseph Dillon (1855-) and Alice Mary Dillon (1855-1931). 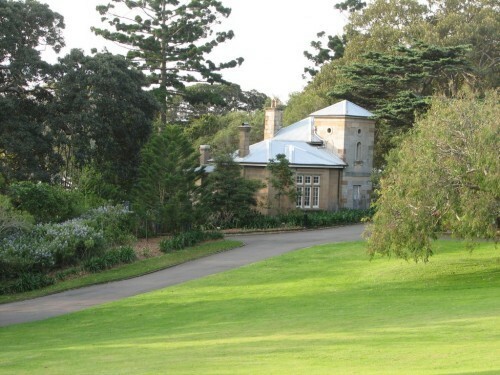 I was fortunate to connect with a descendant of Mary Ann Dillon, Lesley Turner who emailed me with the most interesting information regarding the time when the Kidd family lived in the Sydney Botanic Gardens. These reminiscences by Mary Ann Dillon are so special and I am honoured that Lesley shared this wonder story about her ancestors. “Mary Ann, the daughter of James Kidd, was born in Scotland, she was his eldest child. Her mother had died when she was young.Mary Ann swam in a public baths somewhere on the waterfront. At that time a head covering called a ‘mop cap’ was a fashionable piece of clothing, so instead of combing and caring for her hair, Mary Ann just tucked it under her cap. This went on for some time. Then one day Mary Ann’s stepmother came into her bedroom while she was dressing, with a horrified look at Mary Ann’s salt encrusted, tangled hair her stepmother picked up a pair of scissors and cut it off. Life for Mary Ann without her long hair, was rather traumatic for many months. At the time Mary Ann lived in the Gardens, convicts worked in chain gangs, on the road, public buildings and even in the Gardens. 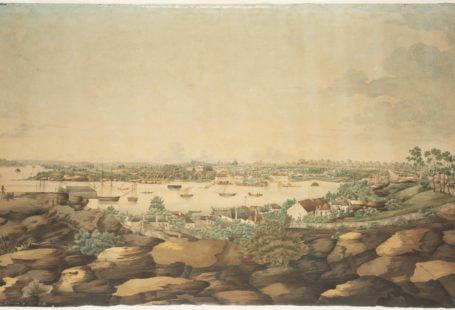 Often late in the afternoon towards dusk, small groups of them would come into the Gardens to pick leaves from certain trees to put on their backs, which were badly cut from flogging.Aborigines were numerous around the foreshore of the Harbour and they often came through the Gardens. Little notice was taken of them, however some were known by name. One winter evening when it was almost dark, Mary Ann was walking home when she noticed a small group of aborigines who appeared to be following her, lurking in the shadows and moving behind trees and shrubs. She felt fear of them for the first time in her life. Mary Ann hurried along, noticing a larger group in the distance she moved towards them, thinking there would perhaps be safety in numbers. She was delighted to notice the head of the tribe amongst the larger group. “Good evening King Billy” she called out loudly to him. “Budgeree Mary” he replied, and waved angrily at the other tribesmen, who then slunk further into the shadows and no longer followed her. Mary Ann married a man named James Melvin. Her father did not approve of the marriage and disowned her. She did not say what her husband did for a living or why her father disliked him. Mary Ann was grateful to be home. However her relationship with her father did not improve, as he disliked her second husband, a man called Dillon, even more. She left Sydney with her new husband and young son to live in the Mudgee district and never saw her father again. In the days before the railway line came through to Mudgee, when Cobb and Co was still king of the road, a friend of Mary Ann’s went to Sydney for a holiday. She was given a letter for the Kidd Family, with the instructions on how to look them up if they no longer lived in the Gardens, in fact they had moved, as the father had died by that time. The sisters were delighted to hear from her and sent letters and photos back. However on the return trip the coach was robbed by bushrangers and the friend’s handbag containing the letters and photos was amongst the things stolen. Mary Ann was very disappointed and never again tried to contact her family. The Dillon family lived on a small farm at Cullenbone, a few miles from Mudgee on the Cudegong River. There were three more children: Alice, John and Joseph. Dillon was Irish and the family were brought up Catholic. 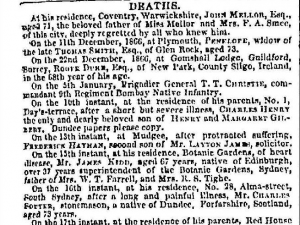 James Melvan [the son] married Ellen O’ Donoghue and went to live in the Cassilis district. He was well known in the area as a breeder and trainer of race horses. Mary Ann’s father James Kidd is described as a gardener. 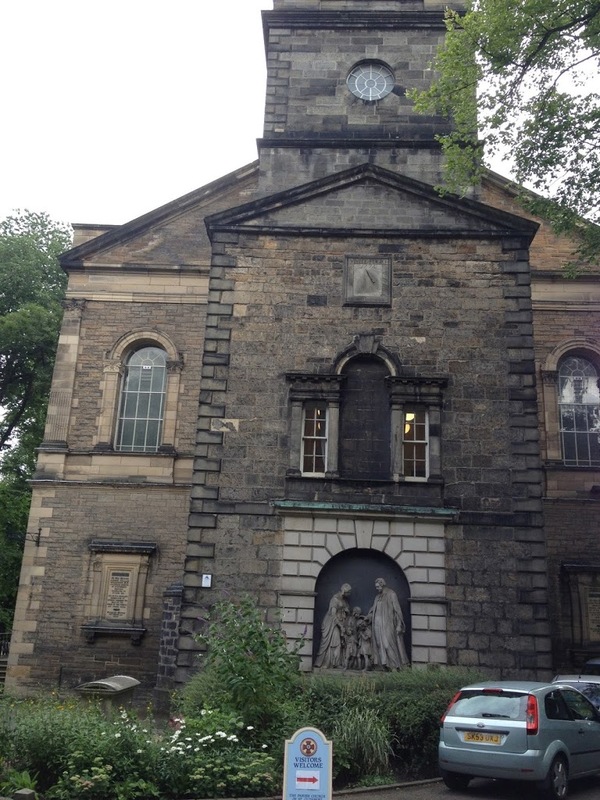 James Kidd and Mary Ross were married at Saint Cuthbert’s Church in Edinburgh, Scotland. This magnificent church is in the heart of Edinburgh next to the Botanic Gardens with Edinburgh Castle towering above. It is a most beautiful place and I feel that Mary must have been a native of Edinburgh and that this was in all probability her family’s parish church. After James’ conviction, Mary’s journey with her children to Australia was from Leith, which is the port of Edinburgh. It is probable that Mary returned to her family in Edinburgh after James’ transportation. A woman alone, with three young children needed protection and emotional care, after such a trauma. It was indeed comforting to know that Mary was close to her sister Jane, who then accompanied her on the voyage on the Drummore to Australia. I don’t know what happened to Jane Ross after her arrival, as yet. I have searched for a marriage record without success. 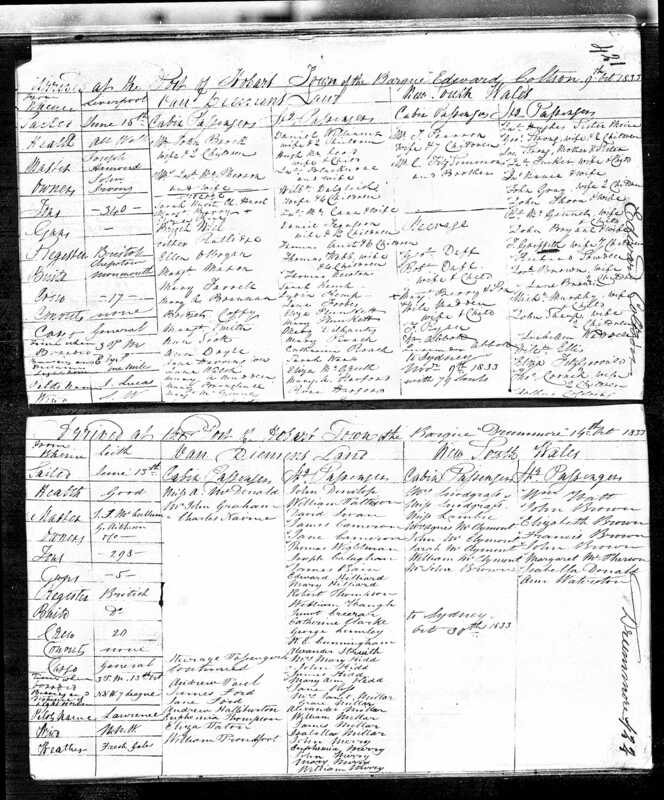 The information that I uncovered from the Orphans School document led me to search for Mary Ross and James Kidd’s life in Scotland, before he was convicted. It was incredibly exciting to find James’ marriage to Mary Ross while searching another website, Family search. 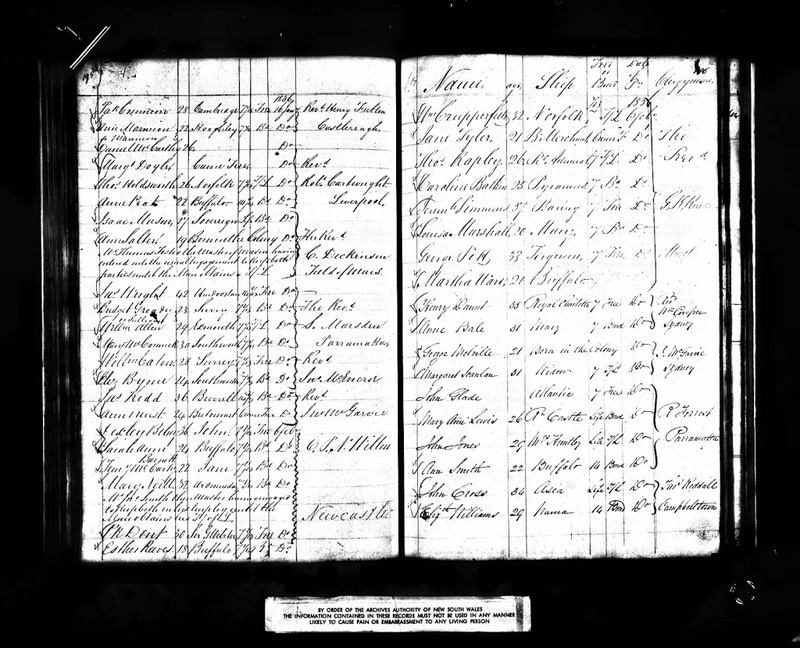 Listed are the online records from the family search website of the Kidd’s marriage at Saint Cuthberts, Edinburgh and the children’s Baptisms from St Andrews, Fifeshire and from Dundee. Mary, I think, being married in her parish church. 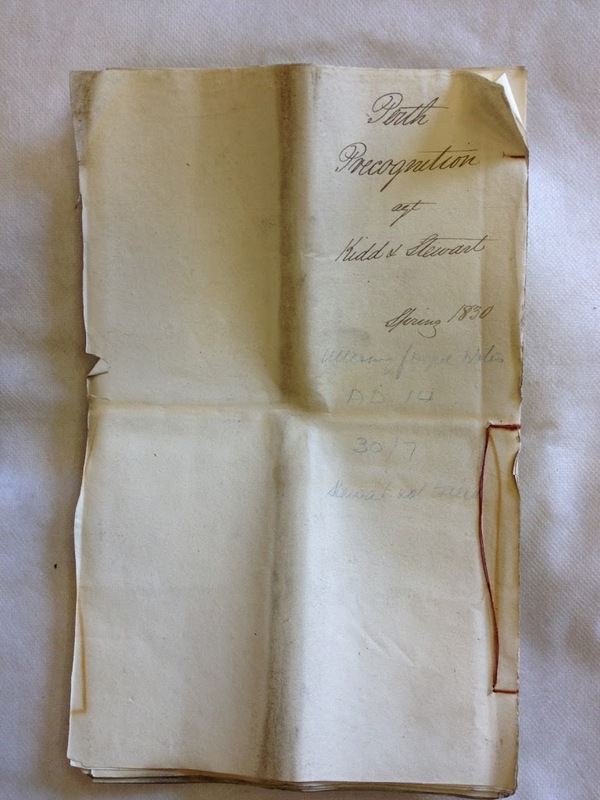 James Kidd’s convict application to marry Mary Ann Must, his second wife, was granted on 16 January 1836, and was supported by the Reverend J McGarvie, who married the couple at St Andrews Presbyterian Church, Bathurst Street, Sydney. Mary Ann Must, according to this record, arrived free aboard the Britomart. 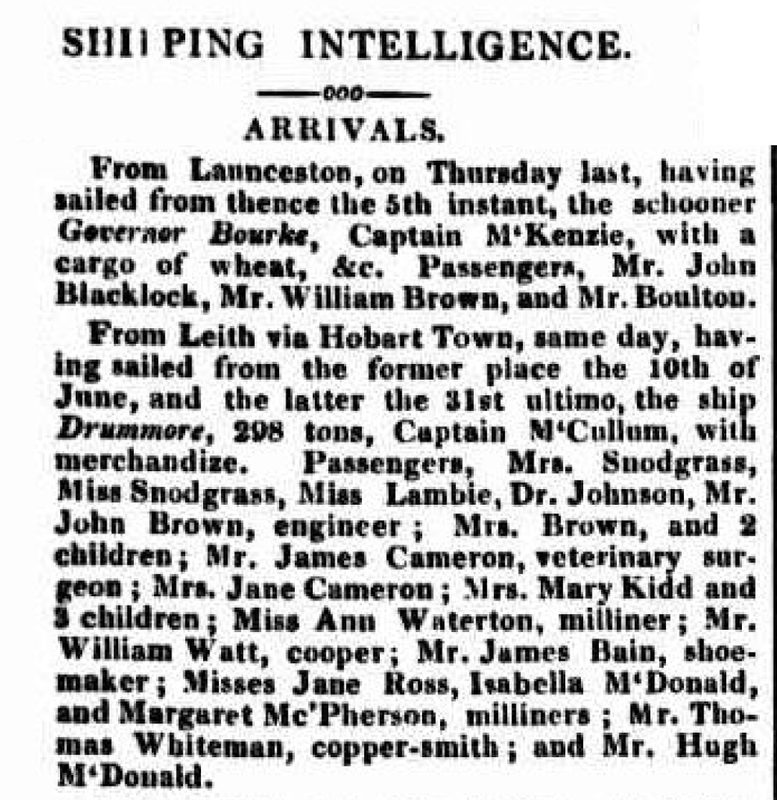 A further investigation revealed the ship arriving in Sydney, via Hobart on 15 March 1822. Mary Ann Must was migrating, possibly as a servant girl looking after the young children of a migrating family, on the voyage from Portsmouth. 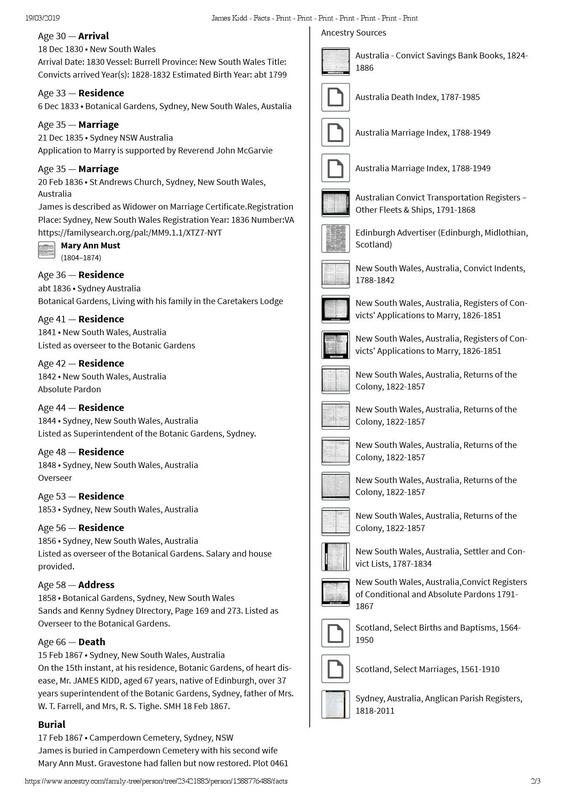 Convict marriages were difficult to achieve, and applications to marry were strictly sanctioned by the Governor of New South Wales and often took an inordinate amount of time to arrange the papers and gain approval. James Kidd had been made Caretaker to the Botanic Gardens on 20 July 1833, and James and Mary Ann Kidd became the first family to make their home in the Caretaker’s Stone Cottage on the premises of the Botanic Gardens. 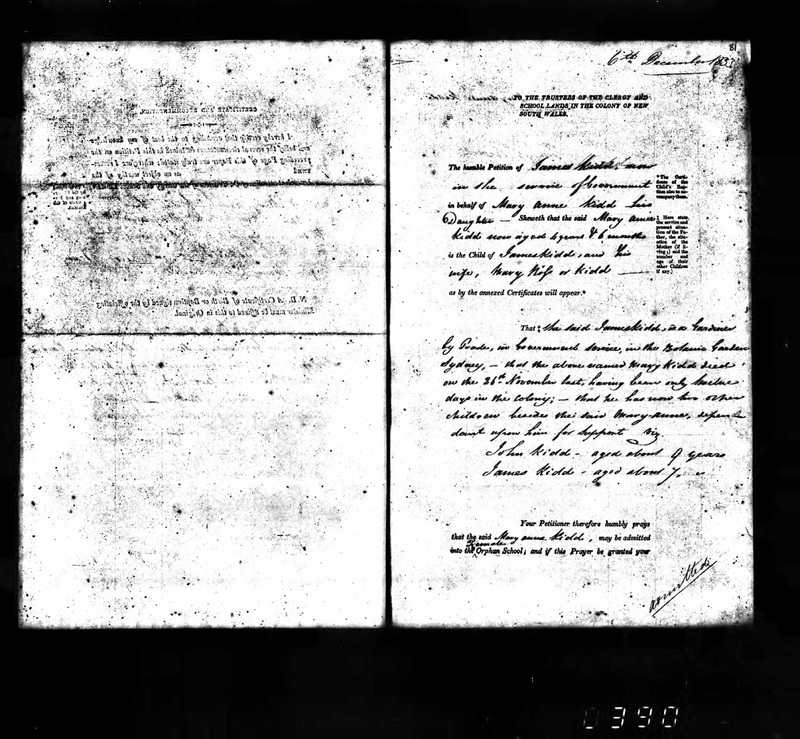 The next document is the Kidd’s marriage transcription and it is interesting that Mary Ann’s brother Thomas Must was the witness to the marriage. The previous illustration was kindly provided by the Botanic Gardens and was an illustration from a report from the 1870’s by Charles Moore, Superintendent of the Botanical Gardens, the Overseer’s lodge is numbered 2 on the map near the private gardens to the south. 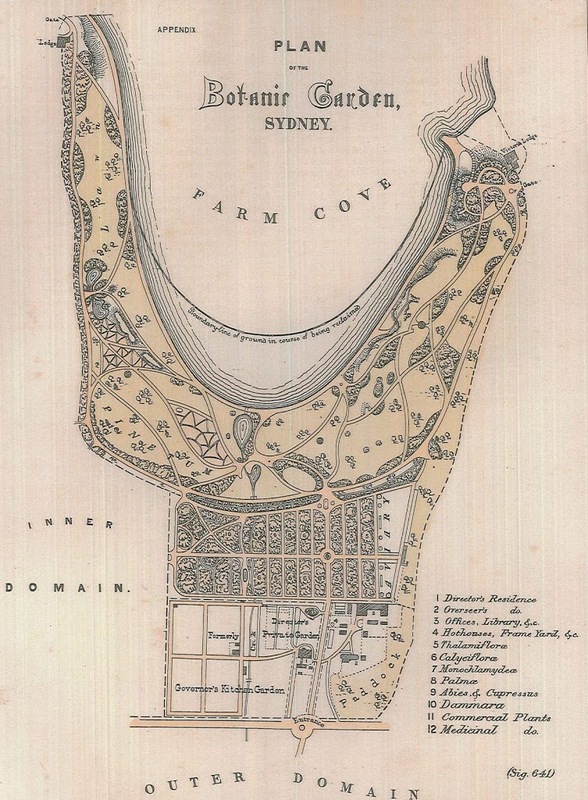 James became Overseer to the Botanic Gardens in 1833, and John Kidd, presumably his son from his first marriage, became Tidemaster/Coastwaiter to Sydney Harbour. 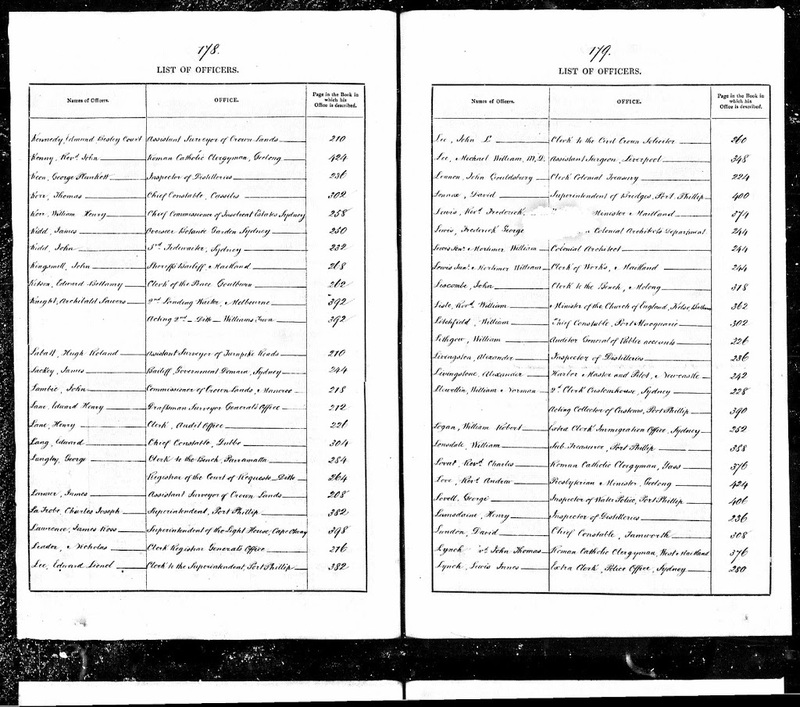 They are consecutively and separately listed in many of the NSW Colonial Secretary’s Returns of the Colony, a compendium of statistics and appointments, James’ salary and housing accommodation are also included in some of the returns. 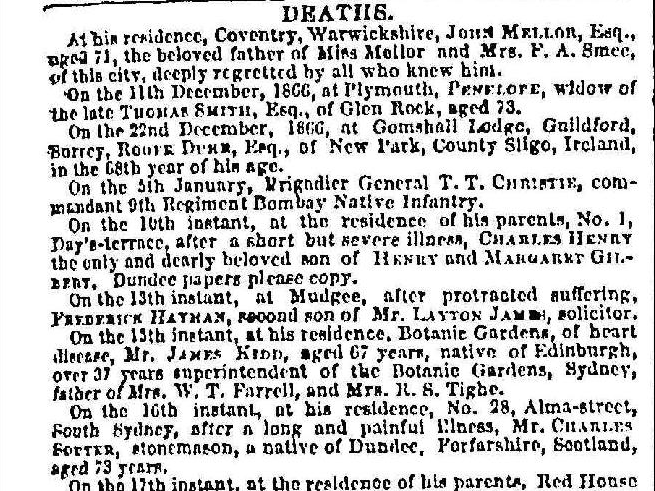 Note that his son John Kidd is included in this return. 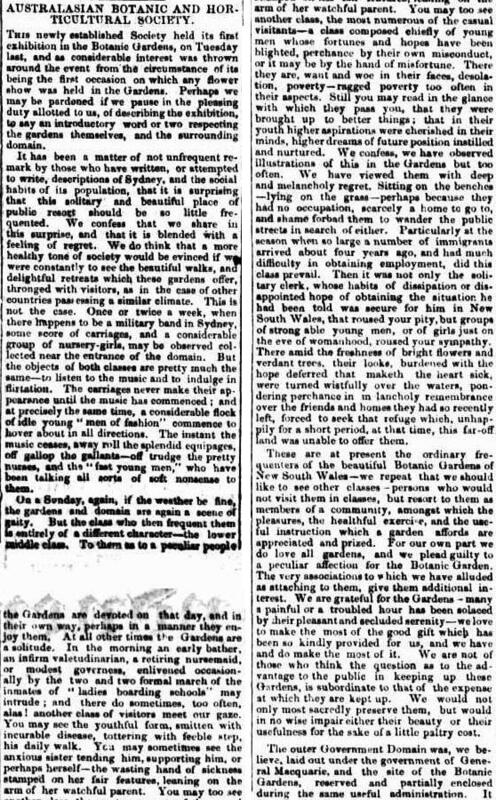 The next article is most interesting as it gives an account of the politics of the Botanic Gardens and it was interesting to research the fate of Mr J.C. Bidwell, whose appointment as Superintendent was overthrown shortly after his appointment. A tussle appeared to ensue and whilst James Kidd was available and most suitable it was deemed that Charles Moore was a preferable choice. Charles Moore was a Scottish gardener, whose family had settled in Dublin, Ireland and his brother David Moore was Superintendent of Dublin’s Botanic Gardens at Glasnevin. One will never know if James Kidd was overlooked due to his convict connections. 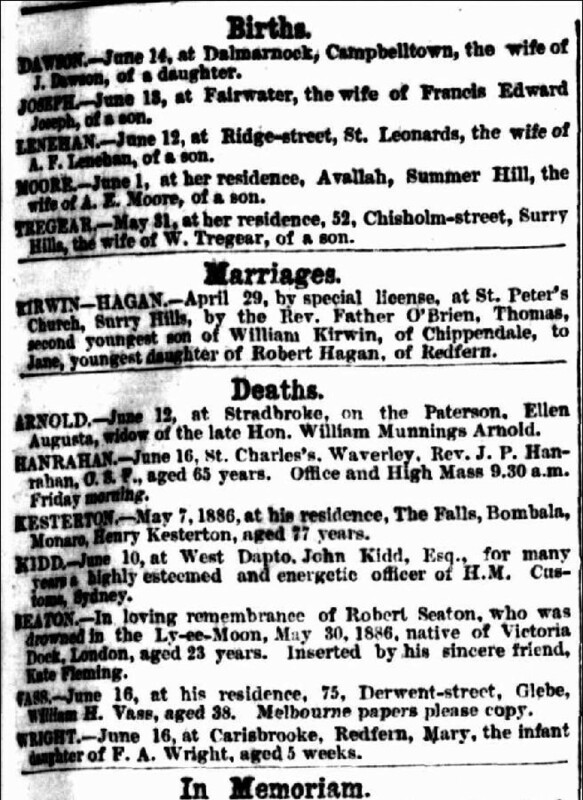 Death Notice of John Kidd, Tide master, from The Sydney Morning Herald 17 June 1886. 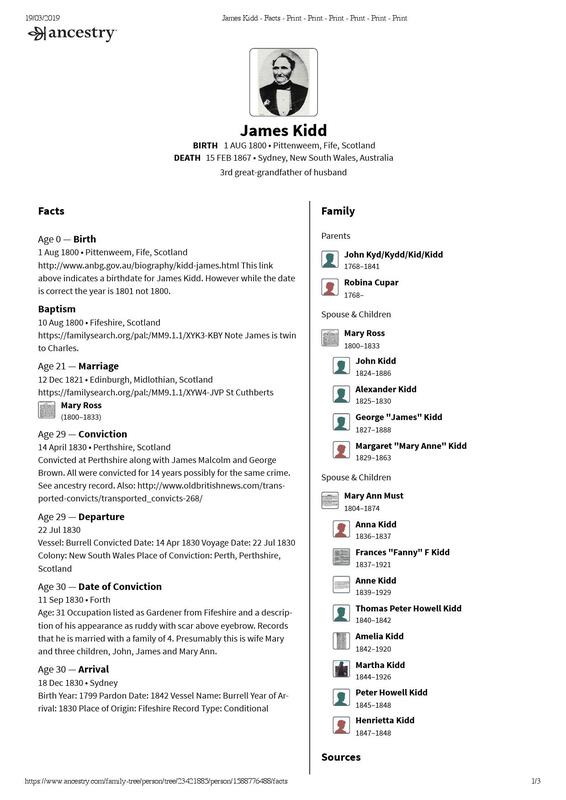 James Kidd (1800-1867) first married Mary Ross (1800-1833) in Edinburgh on 12 December 1821 and they had four children, John Kidd (1824-1886), Alexander Kidd (1825-1830), George “James” Kidd (1827-1888) and Margaret “Mary Ann” Kidd (1829-1897). 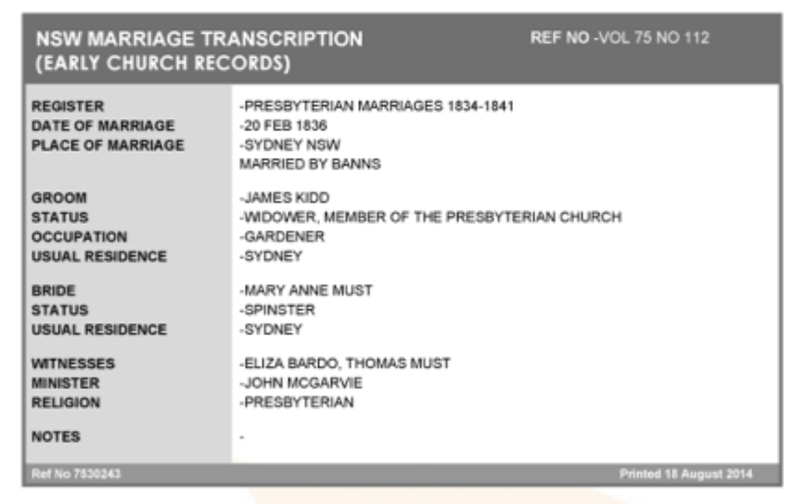 James then married Mary Ann Must in Sydney on 21 December 1835 and they had eight children Anna “Hannah” Kidd (1836-1837), Frances “Fanny” Kidd (1837-1921), Ann Kidd (1839-1929), Thomas Peter Howell Kidd (1840-1842), Amelia Kidd (1842-1920), Martha Kidd (1844-1926), Peter Howell Kidd (1845-1848) and Henrietta Kidd (1847-1848). 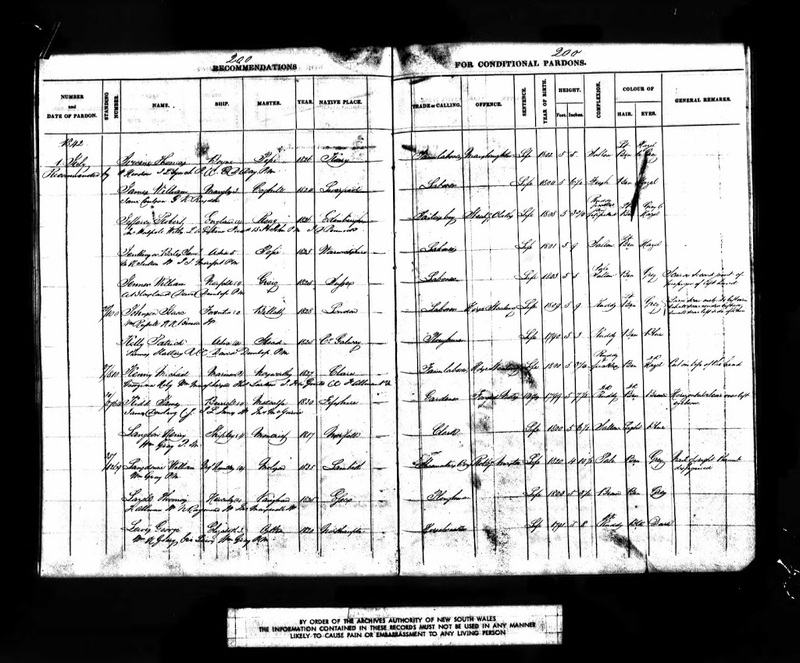 Anne Kidd (1839-1929) married Robert Stearne Tighe (1835-1907) on 6 February 1866 and they had six children, William McLeod Tight (1866-1955), Edith C Tighe (1868-1887), Robert Stearne Tighe (1870-1870), Annie J. R. Tighe (1871-1949), Grace Etheline Tighe (1874-1906) and Henrietta Georgina Tighe (1876-1950). 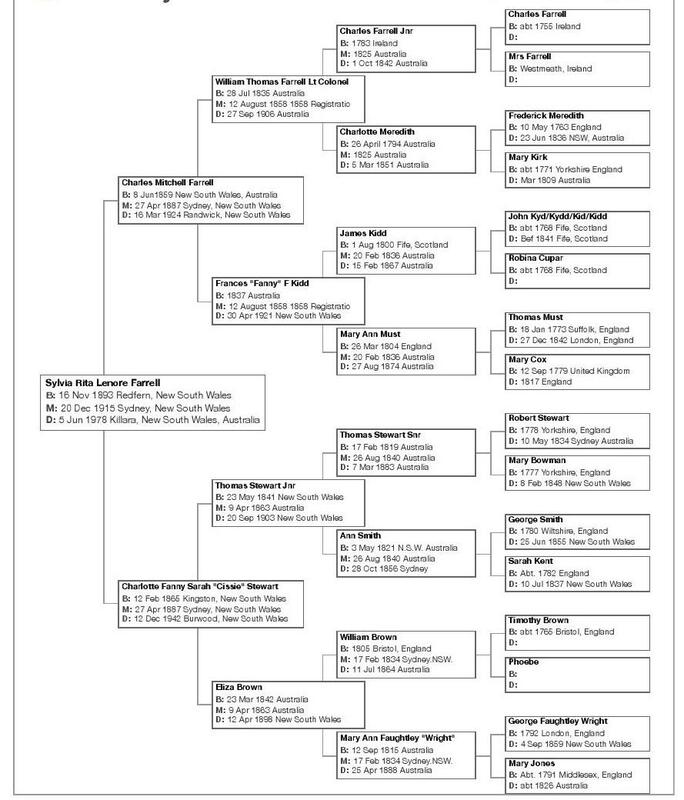 Amelia and Martha did not marry, Amelia died at the age of 78, see her death index below, and her sister Anne Tighe appears to have lived to the ripe age of 90. I just love the death notice for Anne which demonstrates how proud and fond the family were of their father and his achievements. It also supports other stories regarding the children being the first family to be born in the Botanic Gardens in Sydney. There was so much information supplied by this newspaper clipping. 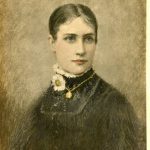 Frances “Fanny” Kidd (1837-1921) married Lt Colonel William Thomas Farrell (1835-1906) at St James Church on 12 August 1858 and they had ten children, Charles Mitchell Farrell (1859-1924) Laura Lavinia Farrell (1861-1864), Frederick W Farrell (1863-1863), William Tighe Farrell (1866-1923), Lydia Frances Farrell (1867-1944), Beatrice Augustine Farrell (1870-1871), Robert Meredith Farrell M.D. (1872-1941), Robina “Olive” Farrell (1874-1945), Helene Augusta Farrell (1875-1956) and Edith Willis Farrell (1877-1950). Fanny Kidd, my husband’s Great Great Grandmother, married Colonel William Thomas Farrell and they had a large family who lived at a lovely home in Randwick called Swan Isle. William and Fanny Farrell’s eldest son Charles Mitchell Farrell (1859-1924) married Charlotte “Cissie” Fanny Sarah Stewart (1865-1942) at St Michael’s Church, Surry Hills on 27 April 1887 and they had four children Ruby “Mardi” Muriel Farrell (1867-1979), Gordon Charles Farrell (1889-1891), Doris Elaine Farrell (1890-1923) and Sylvia Rita Lenore Farrell (1893-1978). Sylvia Farrell was husband Geoff Rundle’s grandmother. Swan Isleis now listed on the Historic Houses Trust, and overlooks Centennial Park in Sydney’s Eastern Suburbs. Colonel William Farrell had a large family monument built at Randwick cemetery, which also lists Martha Kidd, an elder sister of Frances Farrell nee Kidd amongst those buried in the grave. Charles Mitchell Farrell is also buried there, however his wife Cissy Farrell nee Stewart is not. The grave has a magnificent fallen granite monument which was presumably hit by lightning some years ago, causing the column to split and then fall. 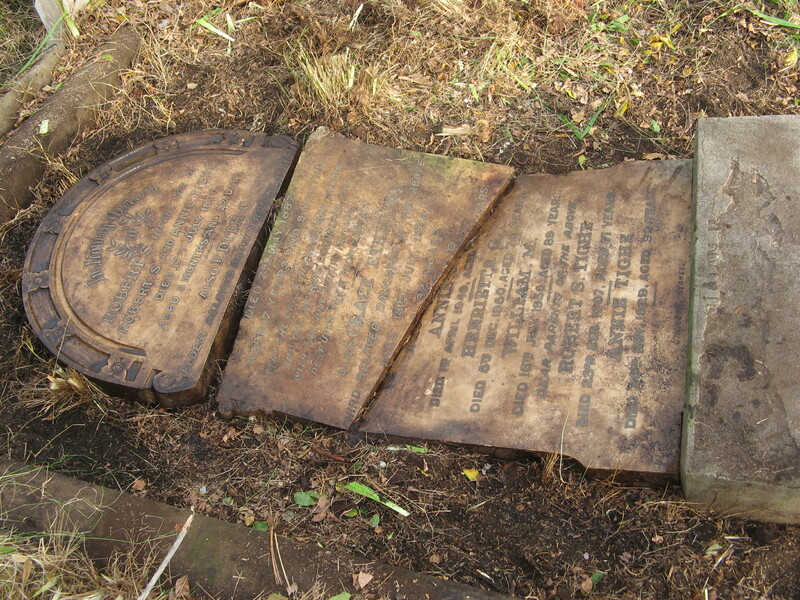 A second cousin of Geoff’s, Elaine Coldham, who is related through Doris Farrell, a sister to Ruby and Sylvia, photographed the monument grave in about 2005, before it was damaged. A further chapter, Charles Farrell of Mullingar, Westmeath, Irelandand his descendants, will feature more about Swan Isle, and include photographs of the Farrell grave monument at Randwick cemetery. 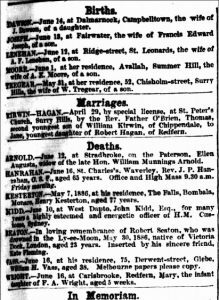 Marriage announcement of the marriage of James and Mary Anne Kidd’s eldest daughter Frances, The Sydney Morning Herald 16 August 1858. Farrell Family Grave and Monument, Randwick Cemetery, Sydney, Martha Kidd and her sister Frances Farrell are listed on this grave. At the bottom of the grave you can just work out the name Martha Kidd. 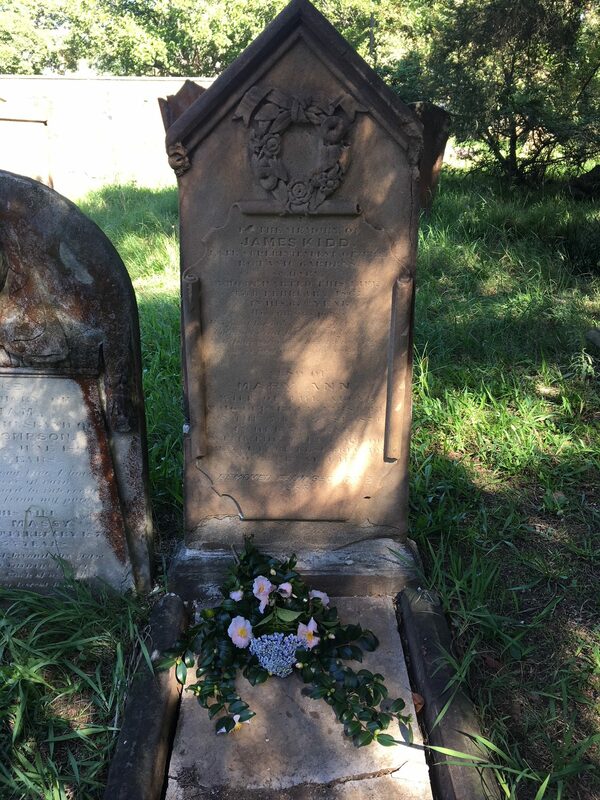 I must say I was pretty well on my own researching the Kidd Family and when I found Martha Kidd buried in this grave at Randwick I was exceedingly happy to think that I had made the correct links between the families and found two siblings. It was about two years before I was to make a connection with Elaine Coldham. I now decided to turn my research to Mary Ann Must, James Kidd’s second wife, and searched English baptism records for Mary Ann Meist/Must and came up with a London Baptism for a Mary Ann Must. Thomas and Mary Must had several other children and it was from these names that I saw immediately a familial naming pattern amongst the names of James and Mary Ann Kidd’s children, born in Australia. The Must’s other children were named Hannah, Amelia and Thomas. The Kidds also had children named Thomas and Amelia. 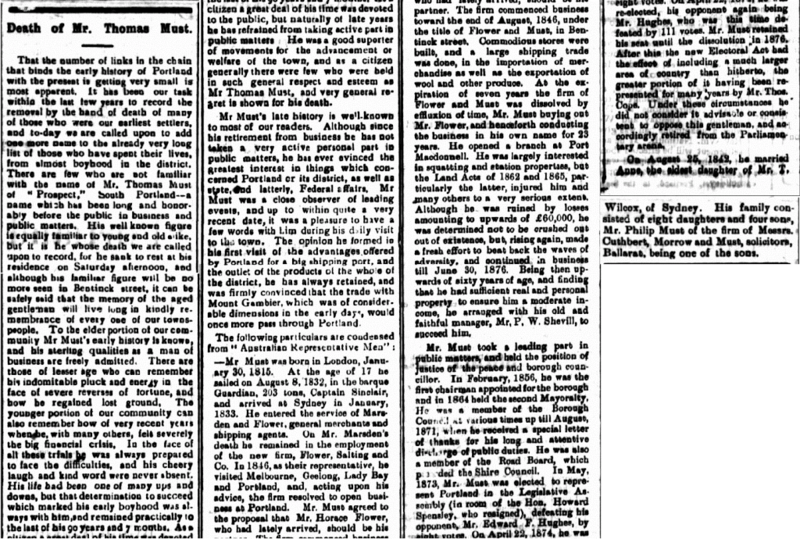 It was also interesting to find that Thomas Must, Mary Ann’s brother migrated to Australia, arriving in Sydney on the Guardian on 20 January 1833. My belief that Thomas Must then reunited with his sister Mary Ann was supported when I found that he was a witness to the Kidd’s marriage shortly after his arrival. Thomas Must was an outstanding citizen of Australia and his obituary from the Portland Guardian reveals his enormous contribution to the shaping of Australia as a nation. I recently connected with another family researcher Jenny Purdie, a direct ancestor of Thomas Must, who gave great insight into the life of Mary Ann Must before her emigration to Australia. 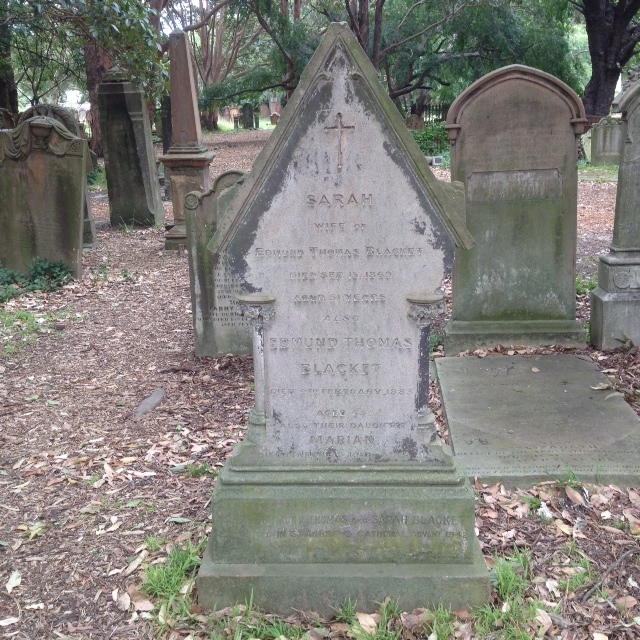 Thomas Must (1815-1905) married Ann Wilcox at St James Church, Sydney on 25 August 1842 and they had fourteen children, Baby Must (1842-1843), Ann Must (1845-1915), Baby Must (1846-1846), Frances Ellen Must (1848-1923), Emily Kate Must (1849-1933), Amelia Must (1851-1932), Marion Lily Must (1853-1931), Clara Must (1855-1938), Thomas Beilby Must (1859-1939), Philip William Mst (1859-1939), Edith Must (1861-1939), Alice Meta Must (1863-1946), Francis “Frank” Must (1866-1934) and Charles Edward Must (1867-1939). 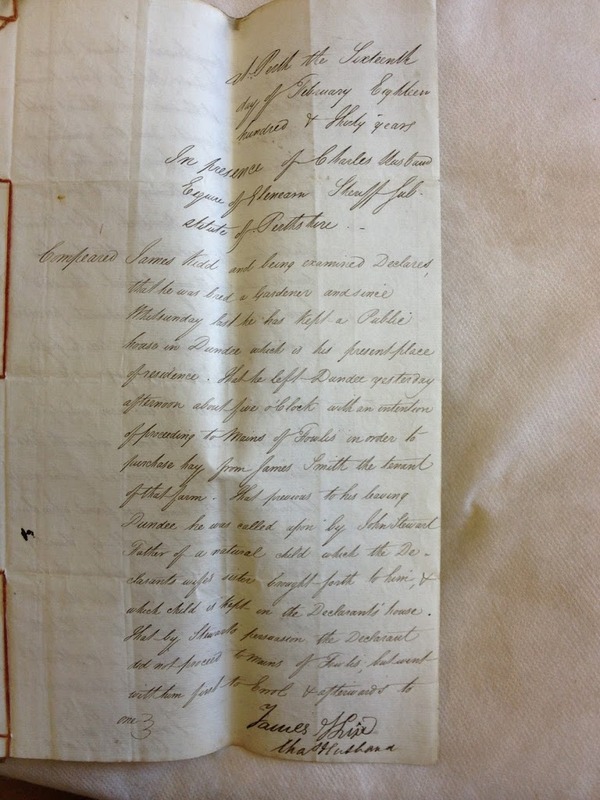 In 1842 James Kidd received a conditional pardon from his conviction; this recommendation was supported by Sir James Dowling, Chief Justice of New South Wales, whose impressive entry indicates that he must have known Kidd well. See this document on the next page. 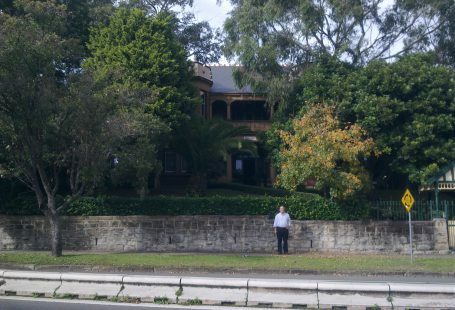 The Chief Justice’s home overlooked the Botanic Gardens in Sydney and it was known that during Dowling’s recuperation from a recurring lung disease, he took solace in the gardens. The information gleaned from these documents is fascinating reading, it lists James’ age at 42, with brown hair and brown eyes, it also noted that he stood 5ft 7ins tall, was of a ruddy complexion with a horizontal scar above his right eye. As a matter of incredible coincidence that my lifelong friend is Susan Mary Dowling Snepp. 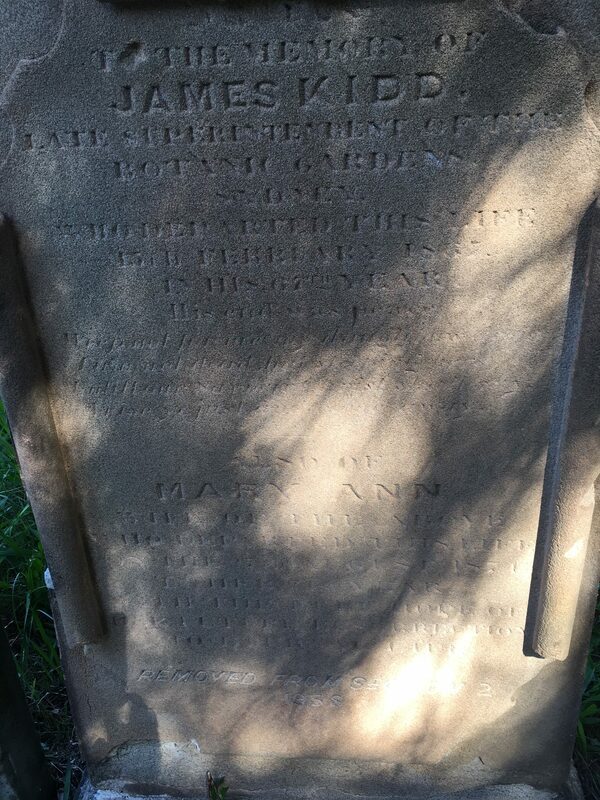 I knew immediately that this was her name sake, and her GGG Grandfather, who died in 1844 and is buried in the ‘dress circle’ at Waverley Cemetery in a magnificent monument grave. I can remember sitting down one morning and showing Sue the document, which was so exciting for us to find such a connection in our family history. 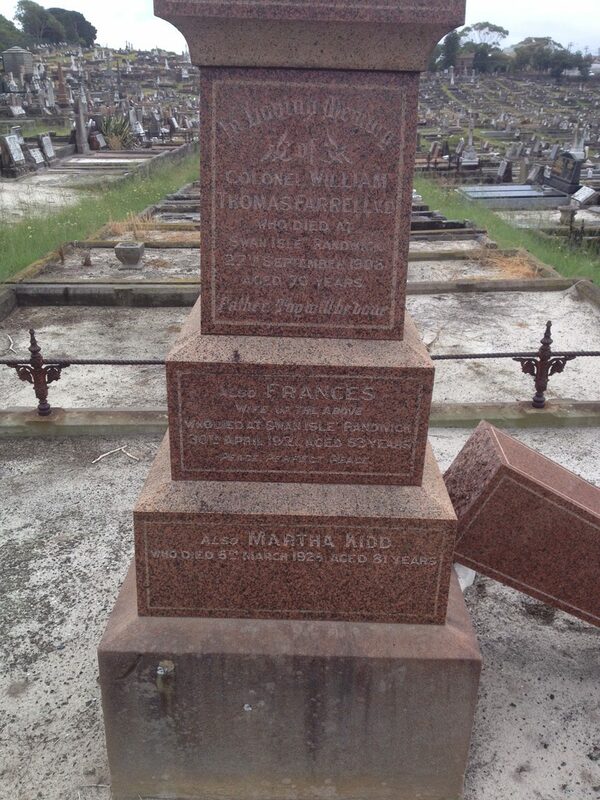 As an aside, the monument grave of Thomas and Eliza Stewart at Waverley Cemetery is only few rows back from the Dowling monument. They were the parents of Charlotte “Cissie” Fanny Sarah Stewart who married Charles Mitchell Farrell. Thomas, being the grandson of Robert Stewart, who arrived aboard the Wyndham. Thomas was a very successful business man who ran an omnibus company operating in Surry Hills, Paddington and parts of the city centre. 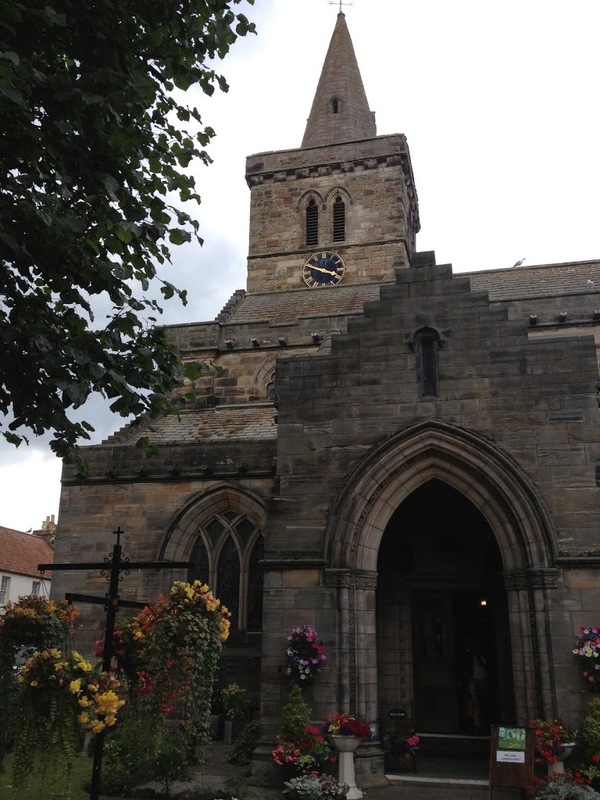 The Stewart Family of Yorkshire will shortly be written up as another fascinating chapter in our family history. During the last two summers Geoff and I have spent a considerable amount of time restoring the Stewart grave at Waverley Cemetery, removing tree stumps and asparagus ferns to reveal a beautiful mosaic floor, which we carefully removed and re-laid. The large grave has a vault beneath and a small side vent accesses the vault. It was sadly neglected and in peril of caving in, today one tree stump remains, and hopefully over time the front of the grave will stabilise. Two years after Kidd was granted his conditional pardon, he was formally pardoned in 1844, and this was the year that he was appointed acting Superintendent of the Gardens by the Trustees of the Australian Museum. However, political lobbying erupted between the Trustees of Kew Gardens in London, who appointed Charles Moore, and the Museum Trustees in Sydney, comprising of Messrs. McLeay, MacArthur and King, who appointed John Bidwell to the same job in 1847. There was fury when Mr Bidwell’s position was seen to be overturned in favour of Mr Moore; however fate intervened when Mr Bidwell lost his life during a surveying trip to Wide Bay in February 1848. James Kidd reverted to a position as resident Overseer, a position he held for 33 years and Charles Moore became Superintendent of the Botanic Gardens for the next 50 years. During his career, James Kidd travelled widely and even visited and crossed the Blue Mountains in a search of seeds and seedlings to plant in the Botanic Gardens. James Kidd was also awarded a silver medal in 1842 from the NSW Horticultural Society for the first olive oil produced in the colony. James was also the first apiarist in the Botanic Gardens, establishing a bee hive in the gardens, to aid the pollination of his plants. 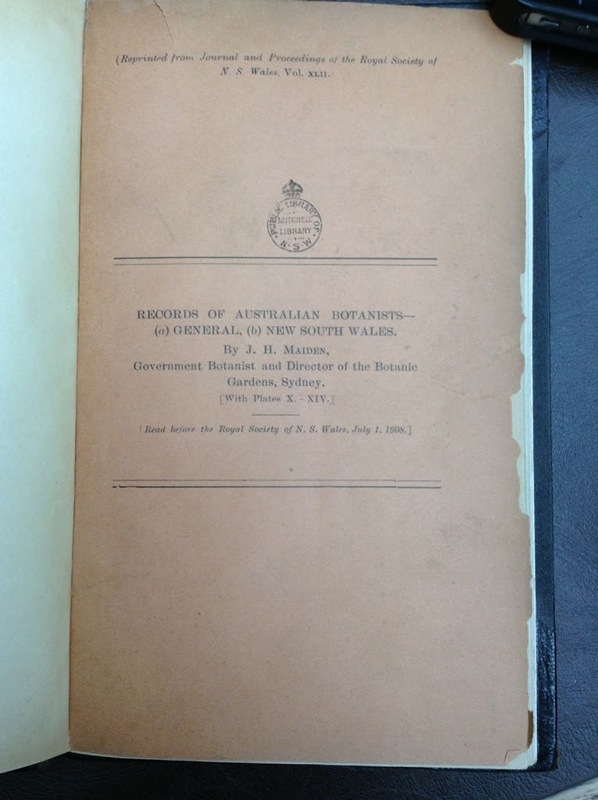 My husband Geoff and I visited the NSW State Library in July 2013 to view a book called “Records of Australian Botanists” by J.H. Maiden, in the hope we might glean some extra information regarding the life of James Kidd. 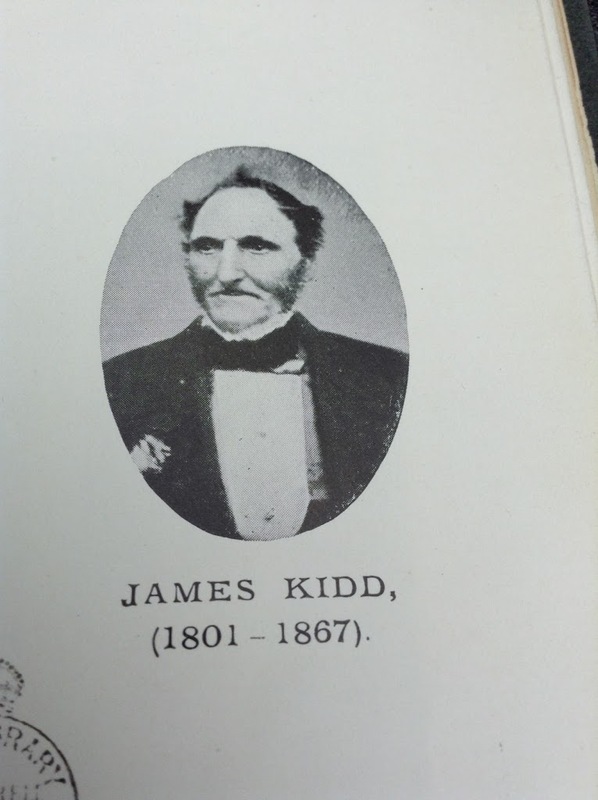 Maiden’s book gave us some exciting information regarding James Kidd, including his photograph, taken in 1863 and his birth date, which solved a puzzle, as there had been three James Kidd/Kydd/Kyd’s born in Fifeshire between the years 1799 to 1801. 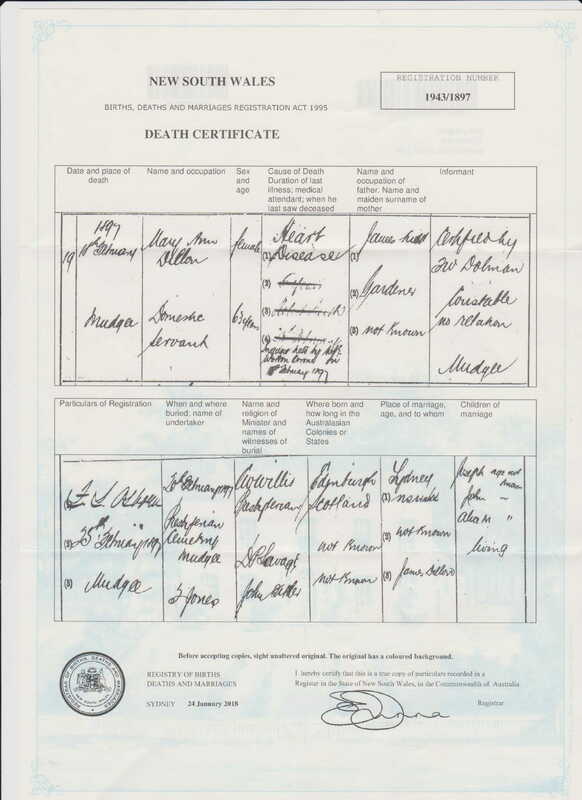 As genealogist I was compelled to be conservative about his place and date of birth until I had found further evidence. 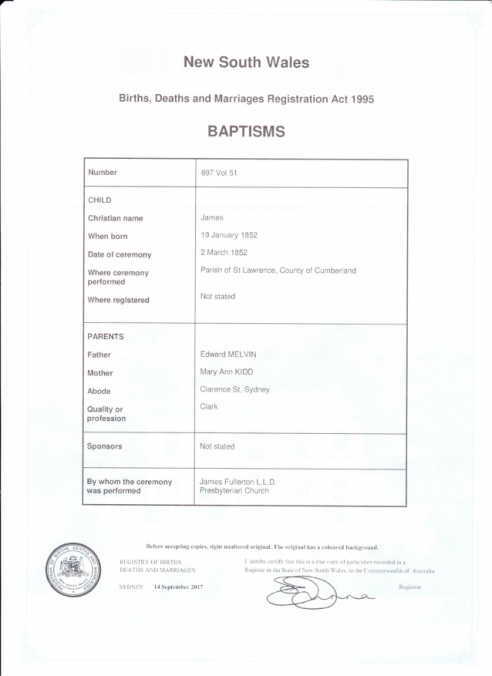 I now feel comfortable accepting this Baptism for James Kyd from Pittenweem, Fifeshire, as the coincidence is too great, regarding his actual birth date, see below. The fact that there is a discrepancy in his year of birth can probably be accounted for by either the persons who supplied the information, most probably being his children, or a transcription error by the author, J. H. Maiden. Much information was verbally passed to biographers and those writing obituaries, in the absence of actual records being available in the early colony of NSW. It is probable that whilst the date was correct, the year given was either wrong or transposed. Leaske, the biographer of ‘Early Australian Families in Australia’ published in 1930, noted in the preface of his tome, that much of his information about early Australian families was passed on by word of mouth, as he could not always access original records. Different spellings of surnames such as Kidd/Kyd/Kydd are commonplace errors due the transcribers’ reliance on verbal communication, often supplied by people who could neither read nor write. 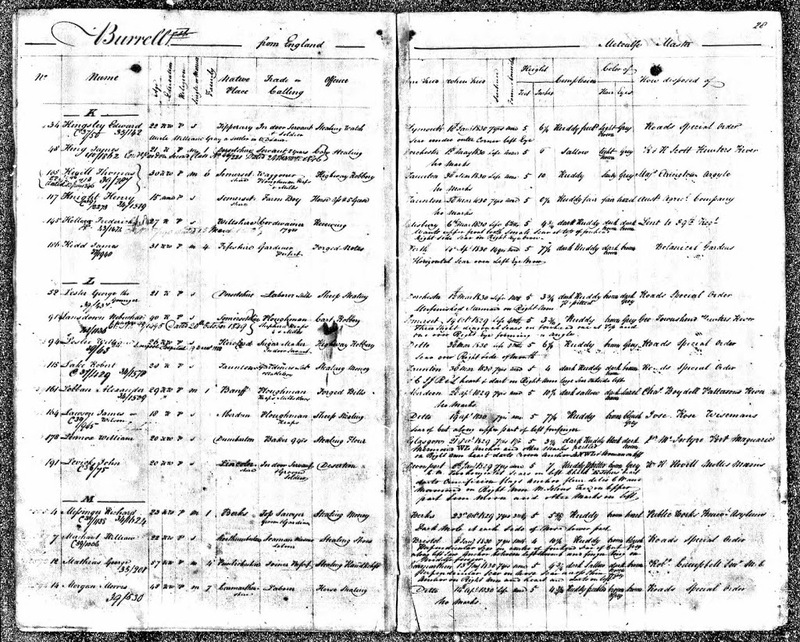 In the case of James Kidd, I believe he could both read and write and his signature can be found on the second page of the application for his daughters admission to Orphan’s School, where it is also verified that Mary Ann Kidd was Baptised in Dundee, this being the place where Kidd lived and possibly was working before he was arrested for forgery. Kidd’s trial papers also included his signature which is compatible. Incredibly James was a twin, and I found amongst other siblings this Baptism from Family Search for his twin brother, Charles. I also found several birth records for their other children and noted that John and Robina Kidd also had a son named George. James Kidd named two of his sons John, after his father and George, after his brother, his other son Alexander could presumably have been his grandfather. My husband Geoff and I visited Scotland in August 2013, when we visited amongst others, the city of Edinburgh and the towns of Pittenweem, St Andrews and Dundee. We also went to the Scottish Archives in Edinburgh, now called The Scotlands People, where we undertook research and met with a Fife researcher and historian who took us through the original hand written Kidd documents, including his conviction. It was incredible to find that the forged pound notes that had been used as exhibits in the court room and attached to the official documents after the trial, had been subsequently stolen. 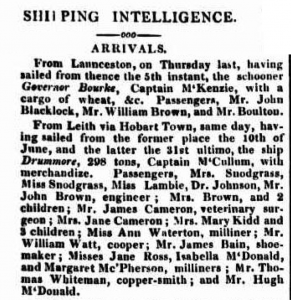 The precognition of James Kidd was available at The Scotlands People, if ordered in advance of your visit, and was listed as “Information from the Edinburgh Archives of Scotland”. 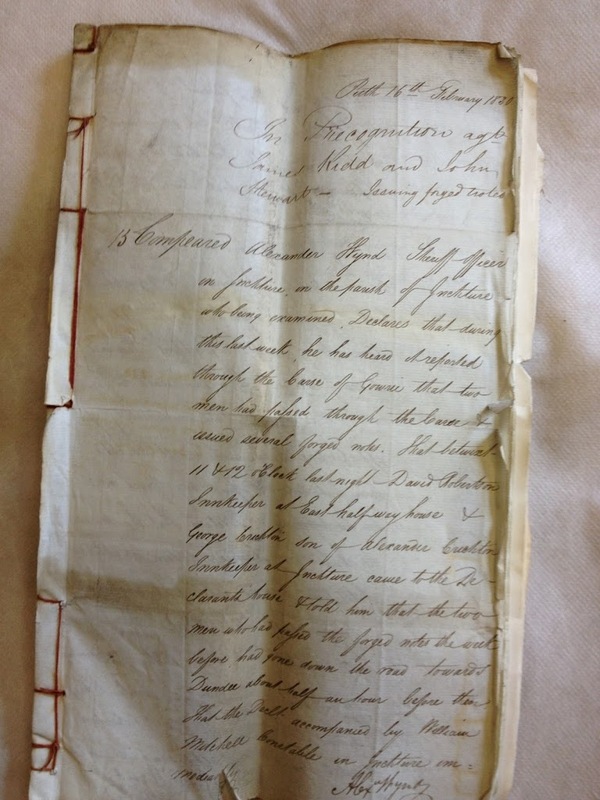 Geoff and I attended the Archives and met with Andrew Campbell from the Fife Family Historical Society, who had kindly ordered these original documents for me. 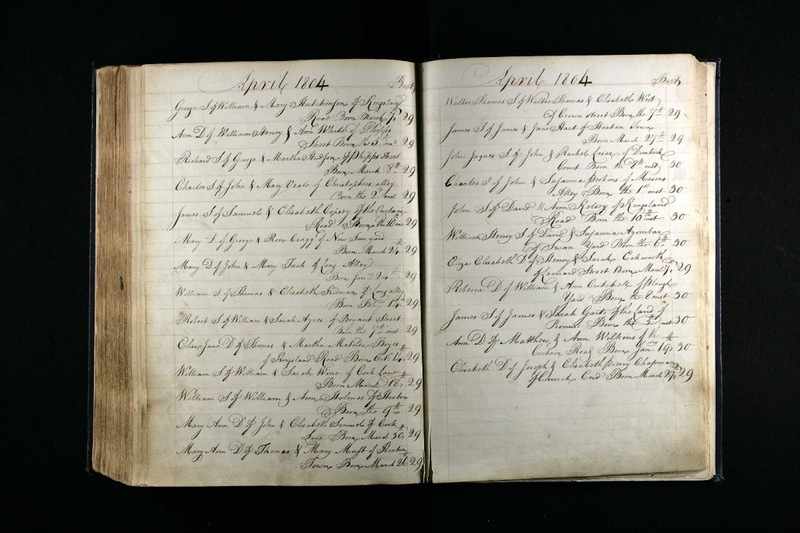 Geoff photographed some of the relevant docs from a large file of handwritten documents. It was amazing to be able to handle these old original documents. It would seem that John Stewart failed to appear, and was outlawed in his absence. It is stated that John Stewart had a relationship with the sister of James Kidd’s wife, presumably Jane Ross, and they had an out of wedlock child. It would also seem that James Kidd was conned by Stewart into this deception, with the forging of notes and whilst Stewart shot through, James Kidd was there to take the blame, the judge noted. More relevant information is available from Andrew Campbell’s email to me dated 19 July 2013 including information that still needs more verification, that James Kidd had worked as a gardener for his first cousin, who had been married to the rector of a St Andrews church. The next four pages are from these original records, which Geoff and I viewed in Edinburgh in August 2013, during our month’s holiday in Scotland celebrating Geoff’s 60th Birthday. As a present to Geoff, our sons Jeremy and Rowan kindly presented him with two tickets to the Edinburgh Tattoo, which included a Cocktail Reception in the Castle, affording Geoff the opportunity to achieve one of his life’s ambitions. I was pretty happy to tag along too! It was a magnificent star lit night sitting in the Castle grounds and an unforgettable event for us both. 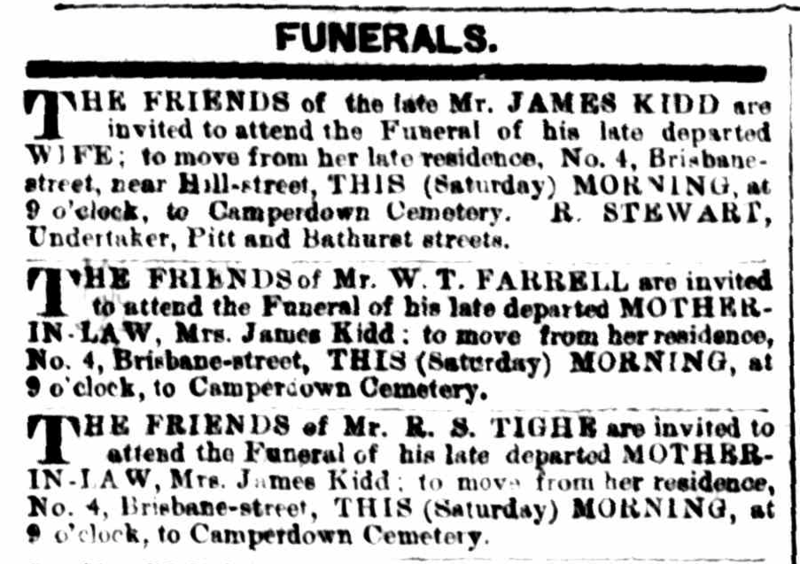 During searches of early Australian newspapers I found James Kidd’s funeral notice in the Sydney Morning Herald, stating that he was buried at Camperdown cemetery and that he died on 15 February 1867. 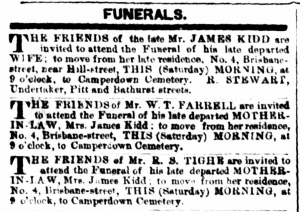 I also found a funeral notice for his wife Mary Ann Kidd stating the same cemetery information. 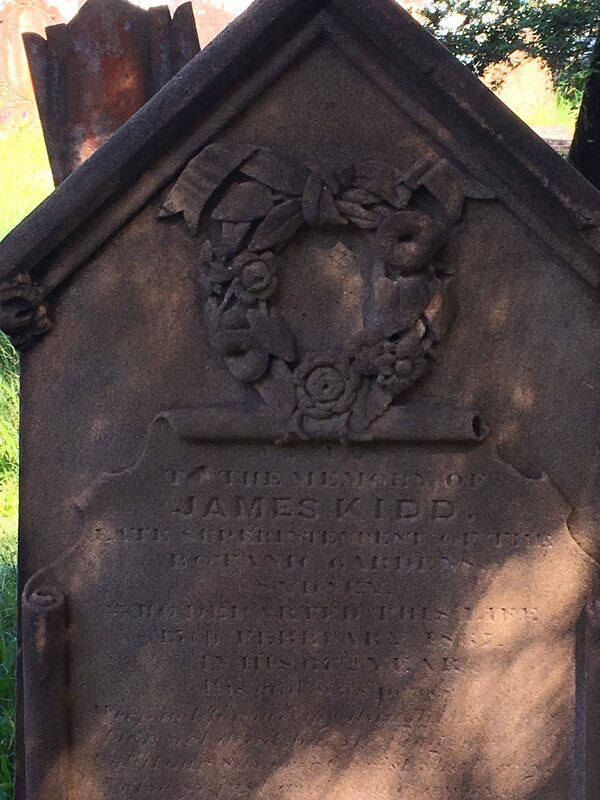 Thus began my search to find the grave of James and Mary Ann Kidd. Geoff and I first visited Camperdown Cemetery in the winter of 2012, accompanied by our brave and faithful West Highland White Terrier, Roy, during a wild rainstorm and although fruitless, it resulted in our falling completely under the spell of this magnificent, wild and most beautiful green place in the heart of Sydney. 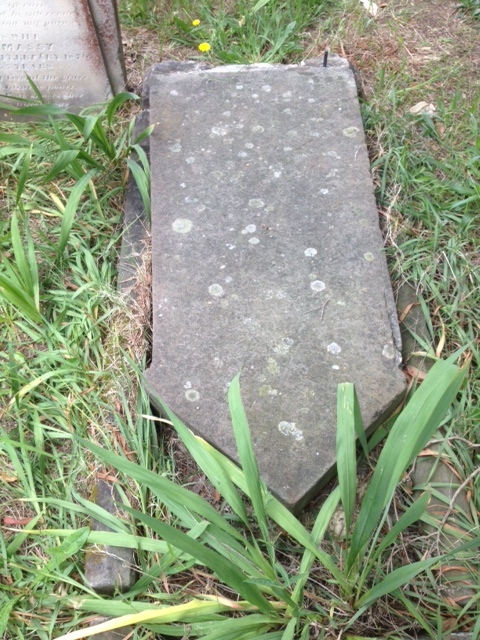 Quite by chance, in February 2013, I found the 1968 microfishe transcriptions of the headstones of Camperdown Cemetery by the Society of Australian Genealogists at their Kent Street Library in Sydney and noted that James Kidd’s headstone mentioned that he was Superintendent of the Botanic Gardens of Sydney and also that the headstone had probably fallen since the time the transcriptions were taken in the late 1950’s, because when rechecked in 1990 a note explained that the headstone was not found. Camperdown Cemetery had been quartered in size in 1948 when Camperdown Memorial Park was created in Newtown. St Stephens Church and the remaining cemetery area was walled off from the park, with many relocated headstones being affixed to the inside perimeter walls. Quite remarkably the Kidd’s grave was reported as having being resumed from the outer perimeter and they were reburied within the existing cemetery during this time. I was helped extensively by Jenna Watson, of the Camperdown Cemetery Trust, who gave me the names of other graves listed nearby, to gain the probable whereabouts of the Kidd grave and from old map co-ordinators, some deductions, much pacing through almost knee high native grasses and a fair bit of luck on a magnificent sunny morning, we examined a fallen headstone on 7 March 2013, which was lifted partially off the ground. It was just enough for my husband, Geoff, to peer underneath and exclaim that he could see and read clearly the original inscription. 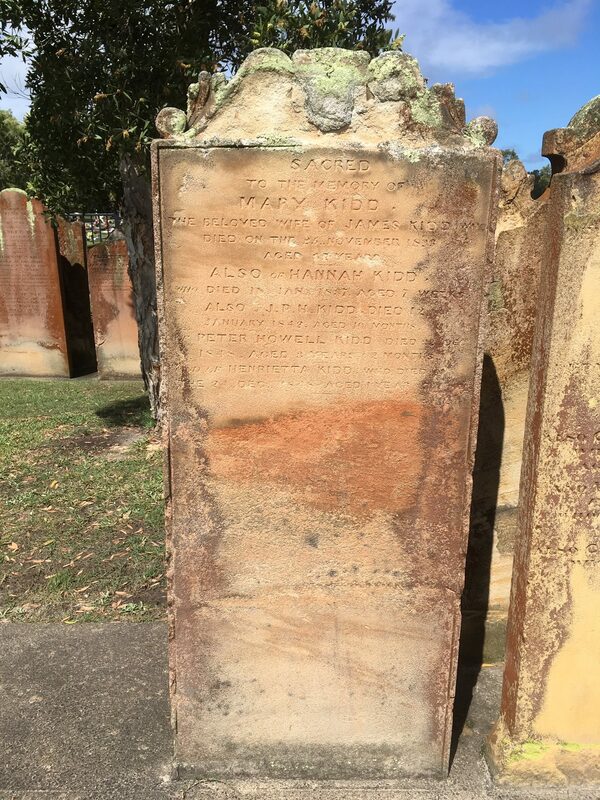 Most excitingly we had found James and Mary Ann Kidd’s headstone, which has possibly been protected all these years from further deterioration by its fallen state. As a genealogist my immediate desire was to lift and restore, however as an archaeologist my concern is to preserve the inscription, which will last longer in its fallen state. 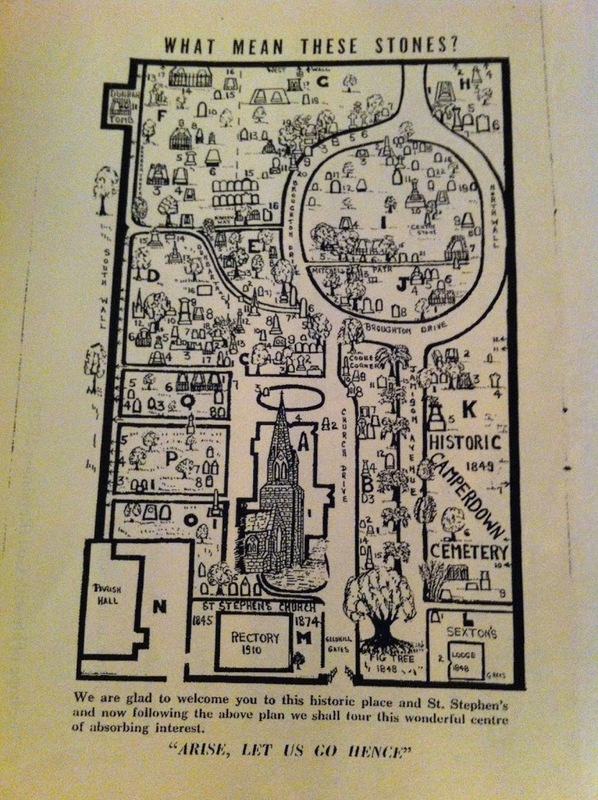 Camperdown Cemetery Map circa 1930. 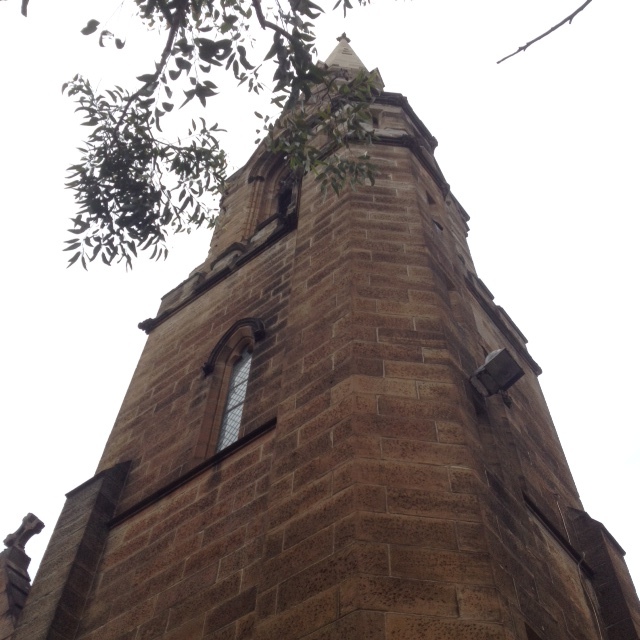 St Stephens Church sits within Camperdown Cemetery and was built by Edmund Thomas Blacket. 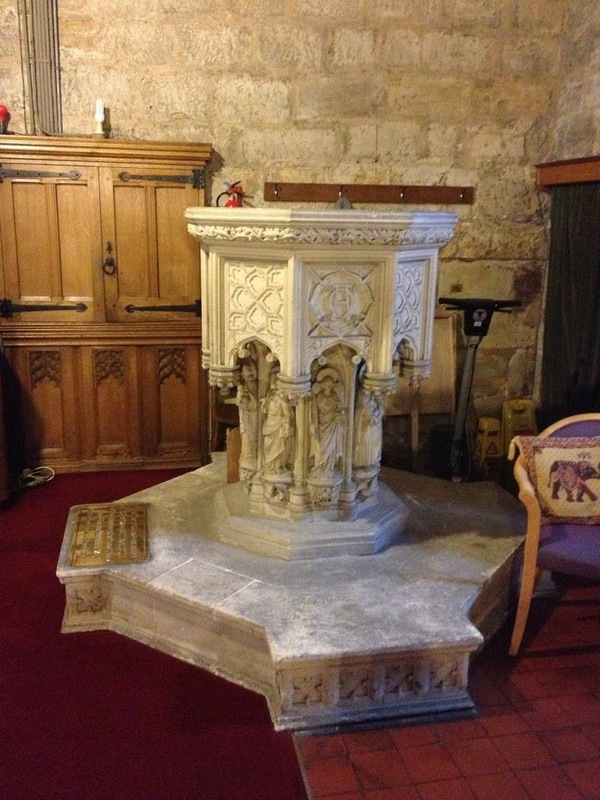 It is a wonderful example of his work and located close by to the western side of the church his grave can be found. In early 2018 work started on several restoration projects at Camperdown Cemetery and with a grant from the State Heritage Commission and several family donors, including our own donation on behalf of the Rundle family work was undertaken. Many headstones were restored, cleaned, graffiti was removed and several graves had their foundations secured. And others had their engravings remarked. We were so lucky that James Kidd’s grave was selected amongst this honoured few and on Good Friday 2018 Geoff and I paid a visit to the cemetery to view the restored grave of James Kidd and his wife Mary Ann Must. It was a magically sunny morning and this restoration is the culmination of my many years of research on the Kidd family. It has been a privilege for me to research the life of James Kidd of Fifeshire. I have appreciated Kidd’s contribution to early Sydney and at the same time I have revealed the family man and his obvious devotion to his large family. I admire James Kidd, a man who was able to turn adversity and tragedy around, to achieve a successful, honest and fulfilling life in the early colony of New South Wales. A special thank you to my younger son Rowan Rundle for his time and patience in helping me add illustrations to this article and for IT help with this website.